Like most people I am a big fan of Wagamama, but it is an expensive way to eat Japanese-style food if, like me, you love all the side dishes. When I visit the restaurant the one thing I cannot resist ordering is the chicken gyoza. These little dumplings are packed full of flavour and have a fantastic chewy the crispy texture which makes them incredibly satisfying. At Wagamama the dumplings are also served with a dark soy, chilli and garlic dipping sauce which, in my opinion, is what makes these little beauties so unbelievably delicious. One day I decided to visit my local Oriental supermarket armed with the official Wagamama recipe for the chicken gyoza. 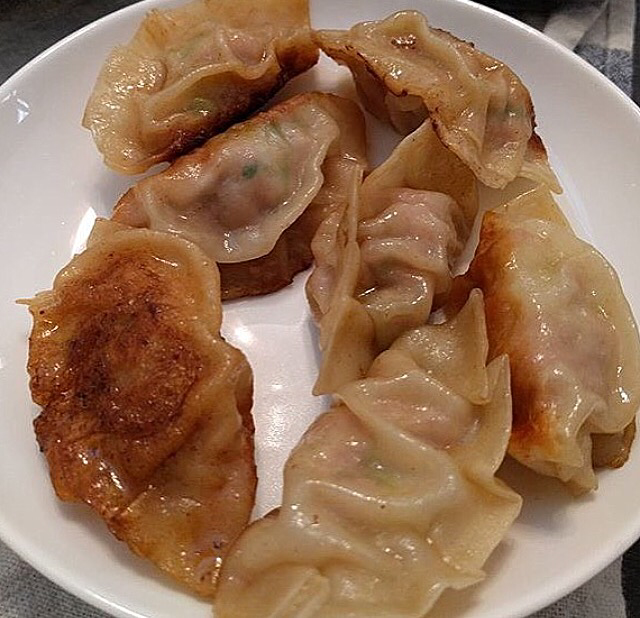 I wasn’t really expecting to be able to have much success when it came to making these dumplings for myself in my own kitchen, but I was amazed to discover that creating these juicy little flavour bombs is actually not only incredibly easy but also very quick. I’ve adapted the recipe a little bit in my various attempts over the years, but I found the ingredients below to be the best for creating at home dumplings. They might not look that inviting but I can assure you, with some additional spicy or garlicky dipping sauce (which I buy from Day In oriental supermarket in The Arcadian), you’ve got a really satisfying snack or side dish to a Japanese meal. This recipe below makes around 40 which sounds a lot, but in my experience it’s best to make in bulk and freeze (when uncooked) rather than try and create this for smaller numbers. You’ll be surprised how far all the ingredients will go! Enjoy. Blitz the ginger, garlic, chinese leaf, cabbage and water chestnuts in a food processor until finely chopped. Mix with the remaining ingredients, except the gyoza skins, till everything is evenly distributed. Place a teaspoon of the mixture in the middle of each gyoza skin, dampen the edge with a little water before folding and crimping. To cook, get a large frying pan and heat 1tbsp sesame oil over a high heat. Place some of the dumplings in the pan and fry for two minutes to get that delicious crispy bottom. Pop three tablespoons of water into the pan and immediately cover the pan with a lid, turn the heat down to allow to steam for two minutes.